I hate writing this post for two reasons- because I'm drooling at the moment, and I probably can't go here for awhile, at least until my stomach lining heals. Yup, I have GERD/Acid Reflux, and I think going to Kyung's so many times triggered it. 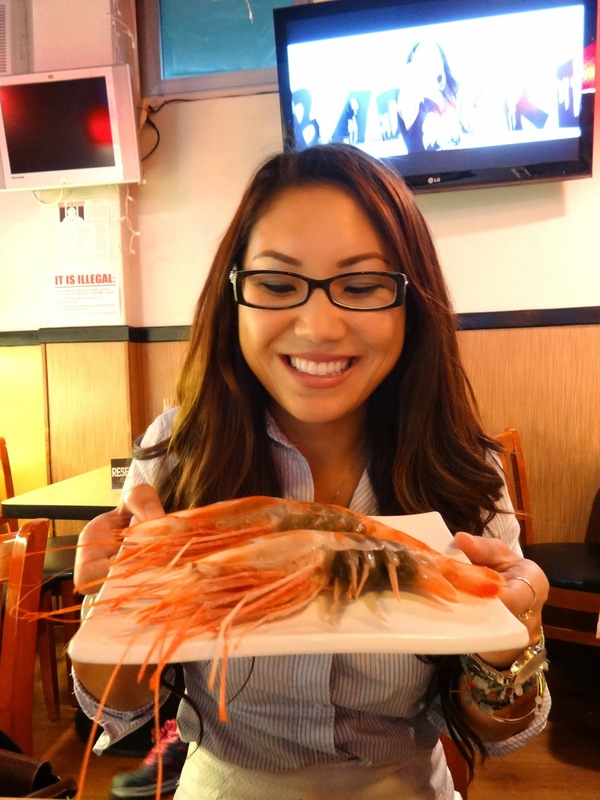 They specialize in seafood; and I mean fresh, fresh, seafood- uni, hamachi, fresh abalone, sweet shrimp from the North Shore, I could go on! But the owners are Korean and they also make some damn good Korean food too. That means everything that comes out from the kitchen is SPICY. So if you can't handle it, ask for everything mild. My favorite? Their spicy tuna. Don't call it 'spicy ahi' because they won't know what you're talking about. The best part is that they usually give a big scoop of this for free with some other banchan sides. The last time, I asked for 3 more heaping scoops of Spicy Tuna to share......and that's exactly how my stomach is on fire now. It's just that good!!! Parking? Street parking on the right side of King Street. This is where the restaurant is located too- right across the street from Tsunami's. If you go early before 330pm, BEWARE, it's a tow-away zone after 330pm on the LEFT side of the street (Tsunami's side). My friends and I learned about this the hard way last time we were here. The tow-away sign is red, but very faded, and if you don't look or look well enough, you might just overlook it like we did. There is also parking behind the restaurant so I've heard, but I've never parked behind before. So, why go at 330pm? Well, their Happy Hour is from 11am-7pm. Yup, lunch time all through early dinner time, get their Strawberry Soju for only $6!!! And this Strawberry Soju is unlike any others- they blend their soju with frozen strawberries, so it's more like an icy, alcoholic strawberry slurpee! Trust me, you won't be able to get enough of this stuff! Other stuff I love? Their Amaebi, which is so fresh it's still in its shell! Big honkers from the North Shore, and only $7. You get to peel it yourself, eat the sweet meat of the body, and then give it back to the kitchen to fry up. The shrimp with little baby tobiko is the best, fried up! Another must-get is their $30 Sashimi Platter which comes with Tuna, Hamachi, and Salmon. You can also sub more Hamachi for less Tuna or Salmon, and for me, that's the way I'd go. The Hamachi is melt in your mouth and like buttah. The first time we went, my friends and I stayed so long and drank so much Strawberry soju, that the owner gave us Salmon Skin for free. Now, I get it every time I go. It's a must as well. Goes so well with a nice big pitcher of ice cold beer. Since then, I've also tried their Garlic Shrimp and Spicy (mild) Tripe, which are honorable mentions as well! As for me, it's become one of my absolute favorite, casual places to eat and catch up with friends. Hopefully, in a couple weeks, my stomach will be strong enough to battle the spicy-ness of Kyung's food. As the saying goes, "It's so spicy, I just can't stop!" Look at these big suckers! Ask for some hot rice with this. Nothing better! Fried Amaebi when you're done with the raw, sweet shrimp! There you have it- Happy Hour from 11am-7pm! Spicy Tripe. Mild. The next time we forgot to add "mild," and it came out very RED. I spy Uni in the fridge! Garlic Shrimp, with a generous amount of garlic! More banchan with Spicy Tuna! Salmon Skin, a third time!